"I Googled the least painful ways," he said. "There were chat rooms even. It was a very dark place." For years, the life of the former standout student, author and sports columnist from North Canton had been "measured out by the crack rock or syringe," he said. Then, on July 7, Larry found his freedom at the IBH Addiction Recovery Center, a 154-acre treatment facility in Coventry Township. For Larry, the road to recovery began with a startling revelation. In and out of treatment centers, he depended on others to cure him. But IBH was different: "They said, 'This isn't about us, it's about you. We'll lay out the plan... but we're not going to carry you there, and if you don't want to be here, you can go,'" he said. "I thank God I stayed." Larry is now almost 8 years sober and works as a residential manager at IBH to help others find the same freedom he did. 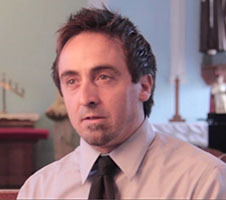 But today, Larry said, the clients who, like him, struggle primarily with opiate addiction are much younger. "Some (are) using intravenous heroin as young as age 14," he said. "The days of the white middle-aged male alcoholic are long gone." While the clients change, the central problem of addiction doesn't, and Larry relies on his own experience to prove to them there is hope. "I tell them, don't leave until the miracle happens," he said. "This is a house of miracles. Hopeless are restored to hope, sick are made well, and if you stick with this, get the miracle – and it will happen – your life will change in ways you could never imagine." 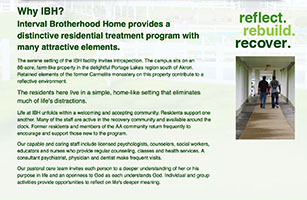 To see more about Larry's road to recovery, visit: www.akroncf.org/videos. Or, to donate to the fund, visit: www.akroncf.org/give/IBHFoundationFund.